No more carrying around separate adapters for various monitors, projectors and televisions. 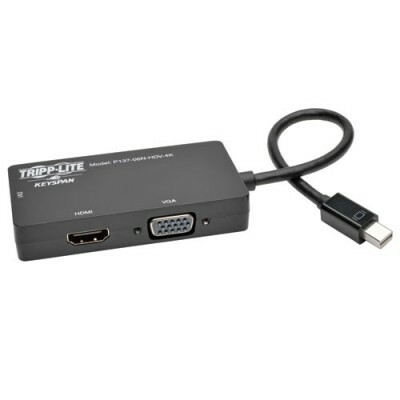 The P137-06N-HDV-4K Mini DisplayPort 1.2 to VGA/DVI/HDMI All-in-One Converter Adapter connects your laptop or tabletâ€™s Mini DisplayPort to a VGA, DVI or HDMI display. The simple all-in-one solution for displaying content on a larger screen, the P137-06N-HDV-4K is ideal for trade shows, classrooms, lecture halls and other presentations. The all-in-one unit contains separate female DVI-D, HD15 and HDMI ports. It supports video resolutions up to 1920 x 1080 (dual-link DVI-D); 1920 x 1200, including 1080p (HD15); and 4K x 2K Ultra High Definition up to 3840 x 2160 (HDMI). It also supports 36-bit Deep Color (12 bits per channel).The P137-06N-HDV-4K is compatible with laptops, tablets and other devices equipped with a female Mini DisplayPort or Thunderbolt port. Itâ€™s completely plug-and-play with no software or drivers to install or external power supply needed. With its small size and built-in cable, the P137-06N-HDV-4K is perfect for stowing in your laptop bag and carrying to school, the office or the latest trade show.